Found an interesting canadian TV promo for the 6 season. Promo once again confirms that the first episodes with Linda were shown in Canada with the main title, shot in the studio. It says the video has expired. I can't play it !!! You can open the video on the other page of the website. 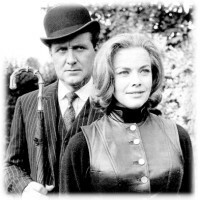 I see that this trailer was assembled from the specially edited introduction film for Tara that was circulated in 1968 with the target titles and the narration from Patrick Macnee. Thanks for posting that! Much appreciated! I miss the old Bravo channel and well remember The Avengers and New Avengers repeats in the 90's. I even remember that particular trailer with the Purdey "Bra-vo!" gag - uncannily appropriate and prophetic. I wonder if Patrick and Linda did any promotion in Canada, as Linda was Canadian it might have created a bit of interest? They were certainly showcasing her in that clip. Oh, thank you for posting this! I've never seen any Canadian promos for the show before--the closest I've ever gotten are promotional stills for TNA, and an LP of the Emma theme. Had a bit of a giggle at the chorus singing, "CTV! CTV!" in the background. I can assure you that they don't use that now. Fascinating! I was wondering that myself. I've never read anything about Linda coming back to Canada to promote it, but that doesn't mean it didn't happen. I kept waiting to see if the voiceover man would mention that Linda was Canadian, but no dice. To this day, I'm a bit puzzled by the fact that the Avengers was shown on CTV, when Patrick was such a fixture on the CBC throughout the fifties. You'd think they'd want to exploit the recognition factor as much as possible. Then again, the CBC has always had to take $1.95 in funding, and stretch it to somehow make everyone happy. CTV was the commercial channel--they had money to buy imported shows. I love the clip choice in the TNA one--it's a saucy, funny little trailer. The Bravo people must have loved it when someone actually said the name in a clip--convenient! So funny these clips and very clever done. She is indeed. She's been around a bit more lately, popping up in a lot of Canadian series. very good points...as Patrick did a lot ofwork in Canada, in the early part of his career and Linda was born in Canada...so the 'angle' was certainly there in that respect. Having read some press from the time, I know they did push the Canada connections for both Patrick and Linda. I'm just surprised they didn't do the same in the promos.